In the Bohr atom, the Bohr distance, , is associated with the average distance of the electron from the nucleus in the ground state of the hydrogen atom. Is this what quantum mechanics also predicts? From Schrödinger’s wave equation, is called the wave function and its square, , is properly considered to be a joint probability density function. This is a term used in multivariable calculus courses to represent a probability distribution function over multiple variables (e.g. the Cartesian spacial variables: x, y and z). 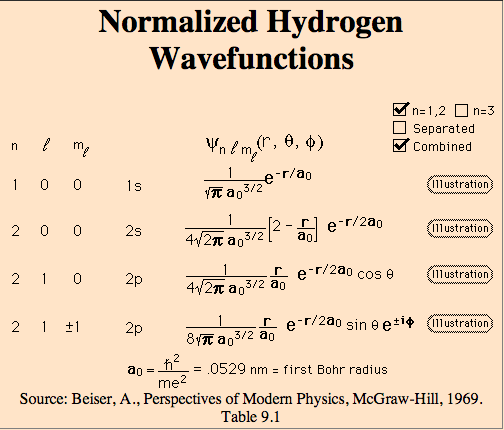 We can snag the normalized Schrödinger wave function solutions for a hydrogen electron from this website. A value of is in agreement with the value obtained in “Modern physics”, by Serway, Moses, Moyer, Example 8.9, p284. Interestingly, this is larger than the Bohr radius itself, but of the same order of magnitude. As I tried to extend this sort of calculation to promoted electrons, I had a harder time getting wolframalpha to numerically integrate the equation. This sort of calculation could be used to determine the expected distance required to promote an excited electron. I still haven’t figured out what held up the calculation but it could be due to a problem with round off error with such a small Bohr radius. It would be especially interesting to do this calculation though to compare the classical Coulombic energy difference between the energy levels to the spectral lines observed for the hydrogen atom. I hope to follow this post up with such a calculation once I am able properly calculate the average distance of the 2s electron.